NEW YORK, New York, January 12, 2011 (ENS) – Global surface temperatures in 2010 tied 2005 as the warmest since recordkeeping began in 1880, finds an analysis released today by researchers at NASA’s Goddard Institute for Space Studies in New York. The cold spell across Northern Europe in November continued and strengthened in December, but that does not mean global warming is over, the GISS scientists said. Scientists with the National Oceanic and Atmospheric Administration confirmed that 2010 is tied with 2005 as the warmest year of the global surface temperature record, beginning in 1880. This was the 34th consecutive year with global temperatures above the 20th century average, NOAA scientists said. The two years – 2010 and 2005 – differed by less than 0.018 degrees Fahrenheit, a difference smaller than the uncertainty in comparing the temperatures of recent years, putting them into a statistical tie. The next warmest years are 1998, 2002, 2003, 2006 and 2007, which are all statistically tied for third warmest year. The analysis found 2010 to be 1.34 degrees Fahrenheit warmer than the average global surface temperature from 1951 to 1980. To measure climate change, scientists look at long-term trends. The temperature trend, including data from 2010, shows the climate has warmed by approximately 0.36 F per decade since the late 1970s. 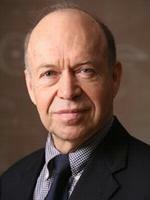 “If the warming trend continues, as is expected, if greenhouse gases continue to increase, the 2010 record will not stand for long,” warned climate scientist James Hansen, the director of GISS. The analysis produced at GISS is compiled from weather data from more than 1,000 meteorological stations around the world, satellite observations of sea surface temperature and Antarctic research station measurements. A computer program uses the data to calculate temperature anomalies – the difference between surface temperature in a given month and the average temperature for the same period during 1951 to 1980. This three-decade period acts as a baseline for the analysis. The resulting temperature record closely matches others independently produced by the Met Office Hadley Centre in the United Kingdom and the NOAA’s National Climatic Data Center. According to the Global Historical Climatology Network, 2010 was the wettest year on record, in terms of global average precipitation. The record temperature in 2010 is particularly noteworthy, said Hansen, because the last half of the year was marked by a transition to strong La Nina conditions, which bring cool sea surface temperatures to the eastern tropical Pacific Ocean. December 2010 is on record as the coldest December across the UK since the national series of measurements began in 1910, the Met Office said in a January 5 statement. But that was not the case around the world. For instance, regions in northeast Canada were more than 18 degrees warmer than normal in December, the GISS scientists observed. “Combined with the unusual cold winter of 2009-2010 in Northern Hemisphere mid-latitudes, this regional cold spell has caused widespread commentary that global warming has ended. That is hardly the case,” said Hansen and his fellow scientists, Reto Ruedy, Makiko Sato and Ken Lo. 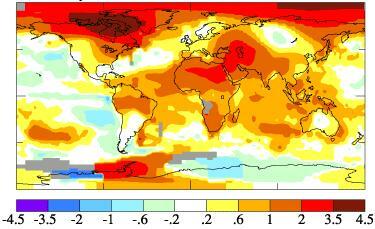 “On the contrary, globally November 2010 is the warmest November in the GISS record,” the scientists said Tuesday. The northern European cold snap may have been influenced by the decline of Arctic sea ice and could be linked to warming temperatures at more northern latitudes, the GISS scientists said. 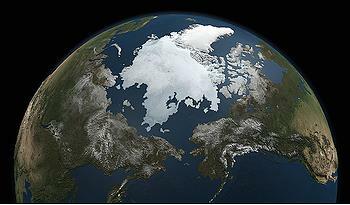 Arctic sea ice acts like a blanket, insulating the atmosphere from the ocean’s heat. Take away that blanket, and the heat can escape into the atmosphere, increasing local surface temperatures. 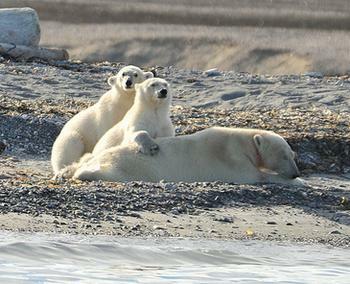 “The extreme warmth in Northeast Canada is undoubtedly related to the fact that Hudson Bay was practically ice free. In the past, including the GISS base period 1951-1980, Hudson Bay was largely ice-covered in November,” they said. The contrast of temperatures at coastal stations in years with and without sea ice cover on the neighboring water body illustrates the dramatic effect of sea ice on surface air temperature, explained Hansen and his colleagues. For the contiguous United States alone, the 2010 average annual temperature was above normal, resulting in the 23rd warmest year on record, NOAA scientists said today. In these 48 states, 2010 was the 14th consecutive year with an annual temperature above the long-term average. Since 1895, the temperature across the nation has increased at an average rate of approximately 0.12 F per decade. A persistent storm track brought prolific summer rain to the northern Plains and upper Midwest, NOAA said. Wisconsin had its wettest summer on record, and many surrounding states had much above-normal precipitation. Since the start of records in the U.S. in 1895, precipitation across the United States is increasing at an average rate of approximately 0.18 inches per decade. Twelve states, mainly in the Southeast, but extending northward into New England, experienced a record warm June through August period. Several cities broke summer temperature records including New York; Philadelphia, Pennsylvania; Trenton, New Jersey; and Wilmington, Delaware. Preliminary totals indicate there were 1,302 U.S. tornadoes during 2010. The year will rank among the 10 busiest for tornadoes since records began in 1950. 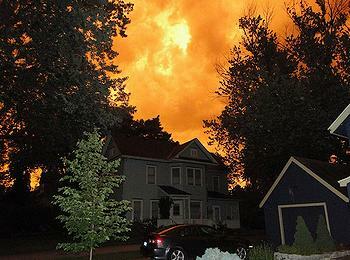 An active storm pattern across the Northern Plains during the summer contributed to a state-record 104 confirmed tornadoes in Minnesota in 2010, making Minnesota the national tornado leader for the first time. During 2010, substantial precipitation fell in many drought-stricken regions. The U.S. footprint of drought reached its smallest extent during July when less than eight percent of the country was experiencing drought conditions. The increased precipitation and eradication of drought limited the acres burned and number of wildfires during 2010. Hawaii had near-record dryness occurring in some areas of the state for most of the year.